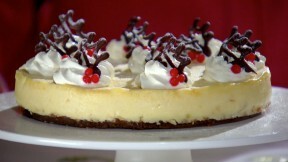 This white chocolate cheesecake recipe by Mary Berry is featured in the Season 1 Masterclass: Christmas episode. Grease and line the base of a 20cm deep spring form cake tin with parchment paper. Melt butter and chocolate in small saucepan over a low heat. Stir in crushed biscuits and press evenly over the base of the tin – chill in the fridge. Whisk the cream cheese and soured cream together in a large bowl until smooth. Add the eggs and vanilla extract and whisk until completely smooth with no lumps. Stir in the melted chocolate and mix together. Fold in the chopped ginger and mix together. Pour in the tin and spread evenly over the chilled base. Bake in preheated oven for about 45 minutes until firm around the edge and just set in the middle. Remove from the oven. Using a small palette knife run the knife around the edge of the tin and then allow to cool and chill. For the decoration, spoon the chocolate into a small piping bag fitted with a size 2 writing nozzle. Pipe 11 small chocolate holly leaf shapes down 2 strips of baking parchment. Place the strips of parchment paper over 2 rolling pins (so they have a slight curl when they set), or rolls of cling film or foil and secure with elastic bands on the end, to prevent them slipping off. Lay the rolling pins on the base of an empty egg box to prevent them rolling. Leave the chocolate leaves to set. Remove the outside ring of the cheesecake and lift the base onto serving plate. Whip the cream to soft peaks and spoon into a piping bag fitted with a star nozzle. Pipe 8 rosettes around the top edge of the cheesecake and 1 rosette in the middle. Place one chocolate holly leaf and 3 holly berries on each cream rosette around the edge of the cheesecake and place 3 chocolate holly leaves and 3 marzipan berries on the cream rosette on the center.